Seven places on the globe provide the perfect combination of weather factors to create hurricanes. One of those places is in the Atlantic Basin. Many of these hurricanes spin into the Gulf of Mexico where any direction they take will result in damage to some community. 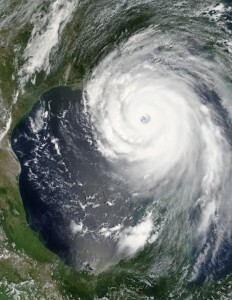 One of the deadliest and costliest of these storms was Hurricane Katrina. It seemed to blow up out of nowhere and to come racing into and across the Gulf of Mexico before anyone had realized how huge and fierce it was. Its winds and storm surge killed over 1,800 people and caused billions of dollars in property damage. For many people in New Orleans and the Gulf Coast, time will always be divided into the time Pre-K and the time after.